Tennis Coach Bo and Tennis Coach Ray show their class by winning the 2017 Pesta Sukan Singapore Open Men’s 35 and over title in convincing fashion in the finals against tough opponents. Displaying an absolute mastery over all their opponents throughout the tournament, Tennis Coach Bo and Tennis Coach Ray cruised through the draw to win the tournament. Widely considered the best doubles team in Singapore, Tennis Coach Bo is a whopping eight (8) time Singapore Open Men’s Doubles Champion and Tennis Coach Ray is regarded as one of the best doubles players both in Singapore and the Philippines. 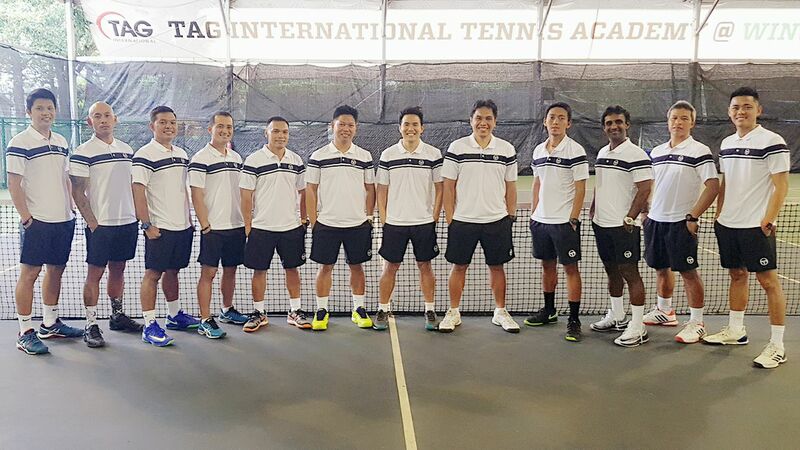 TAG International Tennis Academy is Singapore’s elite tennis academy focused on serious player development for both Juniors and Adults. Founded by Tennis Coach X, since its inception, TAG International’s programs in Singapore have touched more than 5,000 clients. Many of these remain clients of TAG International today, a testament to the standards of the coaching programs conducted by us. TAG International’s strong growth has enabled the company to engage more highly qualified tennis professionals who share the same vision, coaching philosophy, framework and approach to tennis. Tennis Coach – Doubles Mastery by TAG International is a course developed by the collective efforts of TAG International’s coaches. Many players play doubles like the play singles, just extend the center line and each player plays half and rallies cross court. That’s not the way doubles is played. There are concepts like the Worker Bee (the hardworking returner), the Terminator (who poaches off his partner’s good set-up shots), and specific spots on the court where you can draw specific responses from your opponents. There are also statistically advantageous positioning tactics known as “The Stagger” to completely dominate your opponents and limit your opponent’s effectiveness and options. Conversely, we also impart the statistically disadvantageous positions so that you avoid limiting your options and giving away easy points to your opponents. Doubles Mastery also imparts very specific responses to common scenarios that are encountered in a typical tennis match. By knowing the winning responses to these scenarios and constantly practising the shots and patterns, you will be streets ahead of your opponents in thought and familiarity and typical outcomes to easy manage the responses they can put back at you to confidently defeat them. Doubles Mastery by TAG International also focuses on teaching you how to be a better doubles player individually, so that you can partner anyone in your social tennis or club league. The emphasis on when to poach, when to pinch towards the middle, when to steal a point, how to bait an opponent into giving you a ball you want, and the specific footwork patterns required to execute these shots are emphasised. Sign up now and learn how to play the best doubles in your life with Tennis Coach Bo or Tennis Coach Ray, and be loved by your club mates and social groups. Private lessons are the platinum standard of TAG International Tennis Academy’s tennis lessons. Meticulously planned in discussion with you, the client, each lesson is specifically tailored to your exact needs. Technical drill sessions to improve a weakness into a strength, tactical live ball sessions to appreciate the nuances of winning match play strategies, or just a hit about after work after the end of the day in the office, TAG International Tennis Academy’s private lessons offers you the client unparalleled development potential, at the privacy of your own session, at a time of your choosing. Over the years, the TAG International Tennis Academy system has proven to be extremely effective and popular. With several tennis programs for tennis players in Singapore utilising our philosophy of delivering highest quality professional tennis lessons in Singapore based on the latest developments in game technique, theories and teaching methodology, imparted with passion, dedication and attention to detail, our satisfied clients have achieved remarkable rates of improvement and outstanding results in local and international tennis tournaments. Since its inception, TAG International Tennis Academy’s tennis lessons in Singapore have touched more than 5,000 clients. Many of these remain clients of TAG International Tennis Academy today, a testament to the standards of the coaching programs conducted by us. TAG International Tennis Academy’s strong growth has enabled the company to engage even more highly qualified tennis coaches who share the same vision, coaching philosophy, framework and approach to tennis. At present, TAG International Tennis Academy runs a comprehensive series of tennis programs and tennis lessons in Singapore for participants of all ages and playing levels. TAG International Tennis Academy has the experience and expertise to customise its tennis programs to suit the individual needs of its clientele, instead of relying on a standardized, overly structured approach to instruction. For Tennis Coach Bo and Tennis Coach Ray’s profile, check them out at here. For enquiries for tennis lessons in Singapore, please contact us at contactus@tagtennis.sg or +6598395232 and we will be glad to assist you.